Through the TT University Program, TT partners with universities around the world to help them prepare students for careers in the global derivatives industry. We provide our software, free of charge, to dozens of schools around the world, including the Illinois Institute of Technology (IIT). IIT’s Dr. Ben Van Vliet has been using TT’s software as an educator for many years. In this guest post, Dr. Van Vliet looks at the impact automation has had on the markets over time and what it means to the next generation of finance professionals. All of finance is automated. It’s virtually impossible to do anything in finance without turning on a computer and using some form of automation—Excel, databases, charting packages, APIs, execution platforms. The most obvious example of this is automated trading, where the entire life cycle of a trade, from exchange data feed to trading strategy to order management, happens inside the computer. Trading automation is a complex endeavor. It involves programming, mathematics, and strategic thinking about markets and technology. It’s a lot to learn, but this is what markets are about today. An automated trading system consists of the rules for entry into and exit from a position or positions and the technology, both hardware and software, used to make them happen. These rules are a set of logical or mathematical operations that can be based upon qualitative, technical or quantitative research. If students want to actually build automated trading systems that execute trades on electronic exchanges (and they should), they need to learn how to create these rules and work with both real-time and historical data in code. 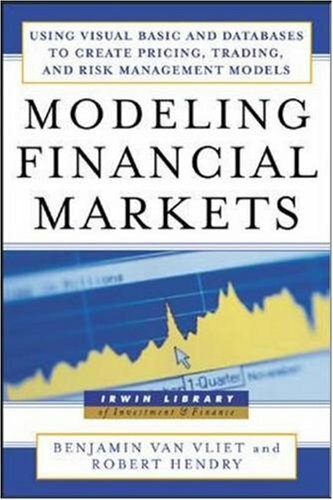 Modeling Financial Markets by Ben Van Vliet with Robert HendryBack in 2004, I wrote a book to teach just these things. It was called Modeling Financial Markets, and it was about two then-nascent technologies, Microsoft .NET and Trading Technologies X_TRADER® API (XTAPI). TT had asked me to help beta test their new API with some students at my university, Illinois Institute of Technology. TT’s technologies were at the time (and still are) way ahead of other vendors. We tried it out and tested various trading ideas and strategies, some of which made it into the book. In the text, I tried to include market-driven, job-relevant information about trading automation as it then was. But, boy, how things have changed since then! .NET has evolved into a widely used programming paradigm, and Trading Technologies has become a world leader in trading automation. But, I still use the original XTAPI object model to demonstrate real-time market connectivity in my classes. Today’s employers in the financial markets demand job readiness. If students want to get a job in the trading and money management industry, which more and more every day is driven by automated systems, they will have to have a competitive level of knowledge. This knowledge includes not just text-book theories about price formation and efficient markets, but also a real-world understanding of markets and intuitions about strategy. What I always liked about TT’s software (and why the financial industry likes it too) is the intuitive feel of MD Trader®. For students unfamiliar with bids and asks and ladders, the presentation of market data in MD Trader is just so good. Students quickly see what’s going on. And, suddenly all the academic mumbo-jumbo comes alive. Limit orders form the price of the financial instrument, and making money is really not easy. Simply guessing about the direction of the price, and pointing and clicking, doesn’t work very well. Traders have long understood that trading is hard. Markets are really efficient and, what’s worse, our human emotions get in the way of good trading decisions. The way to discipline yourself is to develop and stick to a strategy. This is why automated trading has become so popular. The computer has to stick with the program. It doesn’t have any emotions. It won’t change its mind halfway through a trade. TT’s APIs have always enabled automation in a very intuitive way as well. What I call their instrument-centric object model makes it easy to think about turning strategies into coded algorithms, which is what traders and trading firms should think about—strategies, not wrestling with third party vendors’ workarounds that require your own workarounds. For students unfamiliar with financial programming, they can quickly get real-time data into their software. And, with some practice, all the intuitions about trading become technologically clear. Indicators can be calculated. Trading decisions algorithmatized. Orders routed and managed. Of course, TT’s ADL® visual programming platform is just the next evolution of automation to visual development of strategies. Finance students need to understand automation. That is what the industry demands. I’ve always felt that TT software is the best way to teach both an understanding of market microstructure and how to turn a trading idea into a working trading system. It turns out a new source of competitive advantage in automated financial markets is the process of design, development and testing of automated strategies. Once intuition is gained and the technological playing field understood, students can spend time researching and building systems. That’s the fun part. Ben Van Vliet is an assistant professor at IIT Stuart, where he teaches courses in quantitative finance, C++ and C# programming, and automated trading system design and development. Dr. Van Vliet is the author of three books on trading/investment: Quality Money Management with Andrew Kumiega, Modeling Financial Markets with Robert Hendry, and Building Automated Trading Systems. Additionally, he has published several academic and professional articles in the areas of finance and technology, and presents regularly at conferences.